Over forty years ago, General Digital started out doing one thing and doing it well: software development. It wasn’t long, however, before customers began asking if we could do more. And so our long history as contract manufacturers began. Early on, we served as contract manufacturers assembling and wave soldering PCBs for military and medical products. Continuing along this trajectory, we designed and built specialty circuit boards with discrete components, harness assemblies and sheet metal and molded plastic enclosures. With customers such as the New York Stock Exchange, Pratt & Whitney, Bic Injection Molding, Secure-It and Teknor, our prowess as contract manufacturers continues to expand. Our extensive engineering capabilities allow General Digital to provide consultation at every level of the design and integration phase. We work closely with customers through committed consultations, calling on our decades of engineering capabilities and great command of supply chain control. By stepping in to take over a given portion of the manufacturing process, General Digital helps its customers eliminate costly integration steps, allowing them the freedom and flexibility to focus on what they do well, while we focus on what we do well–the mark of a great contract manufacturer. 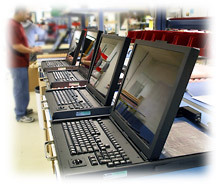 General Digital has been approached by companies that own a product but not a single piece of manufacturing equipment. These are the situations where a contract manufacturing agreement makes perfect sense. Operating within a 125,000 sq. ft. manufacturing facility, we can dramatically alleviate a company’s cost of capital because they do not have to pay for a facility and the equipment needed for production. During our four decades (and counting) in existence, we have invested in the right capital equipment to aid in the production of a wide array of electronic goods: from circuit boards to flat panel LCD screens to waterproof enclosures–and everything in between. Our engineers (electrical, mechanical, software, optical) are present during every stage of the product life cycle, contributing their knowledge and expertise from product conception to product completion. No company stays in business for over forty years without understanding the need for fastidious quality control. For decades, General Digital has employed a Blue Book and Green Book documentation system that ensures orderly custom configuration maintenance for every product and its revision–even for a build size of one piece. With IPC-A-610 certified inspectors and ISO 9001 certification pending, our commitment to the greatest level of quality is evident in every product we deliver, whether built to print or designed in-house. We invite our customers to tour our facility to see for themselves why we continue to pass all of our customers' quality audits. Companies want to work with a contract manufacturer that can provide long-term care for the products on which they place their brand names. Our approach to this requirement is to locate and qualify multiple sources of supply to improve product longevity, while using flexible, modular designs that facilitate the replacement of obsolete components with like or equivalent substitutes. And when our products–and the products that we are contracted to assemble–require repair, our service center offers long-term repair and warranty support, easing the burden for our customers. Like any successful small business, we have grown to meet our customers’ demands. What began as a software development company grew into a proficient contract manufacturer recognized for unparalleled commitment to meeting our customers' needs. Our customers include every branch of the military and many governmental agencies, as well (e.g., Federal Aviation Administration, Department of Energy, U.S. Treasury Bureau of Engraving and Printing). With all of these unrivaled value-add services and capabilities under one roof, General Digital stands poised to custom manufacture your product to the strictest requirements. After all, if our processes are good enough for the military and Fortune 500 companies in every industry, we feel confident that you'll find a perfect complement in us, too. Call us today to discuss how we can serve your needs.